What are the differences between management and leadership? Do you know how to maintain the right balance between the two, given the needs and culture of an organization and its employees? Through taking a broad perspective, we begin to define what leadership and management behaviors “look like” and “sound like” in your organization, taking the general concepts to practical reality. As a leader, you will have the greatest impact when your style matches the needs of your organization and its people. As a result of interviews with your company executives, you will gain a greater understanding of your organization’s expectations for its leaders and how those expectations shift as your company evolves. You will not only have a clear road map for leadership success at each stage of your company’s development, but will also enhance relationships that support greater visibility and support for your career development. A top challenge for any organization is communication. Through the use of the Myers-Briggs Type Indicator, you will gain insights into how others communicate, process information, make decisions, and prefer to work. With an understanding of your individual and collective strengths, excesses, and potential blind spots, you will be able to communicate most effectively while embracing your differences and leveraging your strengths for a stellar performance. Capitalizing on your strengths provides value to your team and your organization, and yields the quickest, most effective results. Whatever your management style, the key to success is discovering and developing who you are as a leader. Through the use of a Strengthsfinder tool, you will identify your strengths and explore how they can be leveraged to increase employee engagement, productivity, retention, and help you achieve your next level of success. In the life sciences you are doing cutting edge work on tight budgets, with minimal resources and immense pressure to meet critical milestones. Goal setting and planning will enable you to make the intangible tangible, align and focus your team for success, and support you in working most effectively and efficiently. By embracing the SMART goal framework, you’ll learn to establish clear, specific, measurable goals and appreciate the enormous impact that goal setting and planning can have on effective implementation. Do you feel like there is never enough time in your day? As you identify High Payoff Activities, your day will become focused on activities that have the greatest impact on your personal and company success. This session will provide you with tools, technology and strategies for controlling interruptions and creating meetings that are efficient and well run, saving you precious time each week. Through lessons learned by using your companies as learning laboratories, we will identify the approaches, mindsets, and skills used to most effectively enhance the performance of your direct reports and team members when coaching and providing feedback. Listening, engaging, and the use of appreciative inquiry will enable you to clarify goals, define the paths for achievement, and create measurements for success as you work together with your employees in supporting their professional development. Delegation is a powerful tool for achieving results faster, developing skills in others, and minimizing risk in your company. You will learn to assess an employee’s level of competence and commitment and leverage the Situational Leadership model to create a work environment that is more productive, fosters creativity and provides opportunities for growth. Selecting the right talent is the difference between success and failure and key to creating a desirable work environment where individuals are highly engaged and productive. Gain the skills required to select the right candidate by first understanding the desired outcomes and the competencies necessary to achieve them. Using a behavioral based interviewing process you will learn how to formulate the right questions and select candidates based on observable facts and evidence, not feelings and impressions, ensuring you get the strongest candidates with the best possible fit your organization and it’s culture. How can you get a team performing at its best quickly and with minimal pain? In this module we will explore both leadership and team member skills and behaviors that enable teams to effectively balance the task and relationship aspects of teaming, reaching high performing status in record time. Through the use of an engaging and highly competitive activity, participants will apply many of the skills learned in the program to demonstrate their strengths as team members, as well as opportunities to enhance their performance. Four days of self-reflection, skill development, and application all come together as participants present their personal case studies in small learning cohorts. The teams create action plans which integrate all the program concepts to address challenges and opportunities ranging from dealing with difficult employees to accelerating progress toward an IND. The results are phenomenal as every participant is able to visibly measure their increased growth and knowledge. Tell me a little bit about this program. Our leadership and development programs are designed exclusively for the life sciences and customized to meet your specific challenges and goals. From The Laboratory To Leadership: 25th Anniversary Edition, turns science minded managers into capable business leaders. That means they’ll get the core management skills they need to fully leverage your company’s human capital. For a complete program description and syllabus, click here. The program is designed for science-minded, first-time managers, as well as, managers seeking to expand their management skills. While the majority of participants are scientists who have been promoted to a management or team leader position, the program also supports the development of those who serve in other management roles in a life science company, whether that is in a quality, manufacturing, regulatory, clinical or administrative function. The program is also an excellent way to develop high potential, individual contributors, whom you are readying for promotion. We developed a look and feel to the program, from the binder design featuring art based upon the science being conducted in some of the most prestigious labs in the country, to the user friendly layout of the content, making it easy to instantly access the most critical concepts in the program. The program includes updated content from the original program that remains relevant to the industry, while adding new modules that address the challenges faced by today’s leaders in the life sciences. See the program syllabus for an overview of the program content. Assessments, activities, videos and websites have been integrated to enhance the learning experience and outcomes. Current reading lists, web-based resources, articles and videos are available to participants through the Graduate Resources on our website. Through the use of multiple learning techniques, we address a variety of learning styles and generational preferences. Participants never feel like they are in school or being lectured to. The sessions are comfortable for participants, yet highly dynamic. Led by highly experienced facilitators with tremendous industry knowledge, participants discuss and explore the content through group discussions, individual reflection, learning pods, team-learning, and using their companies as laboratories. They will share and implement best practices that are learned in their sessions, as well as from their company. There are even opportunities for the participants to serve as facilitators in the program, sharing the results of their learning pod activities. Content and activities have been designed to achieve great levels of implementation and impact. Using the “company as a laboratory” concept, participants will gain a greater understanding of the business, in addition to the science that their companies are founded upon. As they interview individuals in their companies and/or make observations, they also build strong relationships across the organization and increase their organization visibility. This allows them to make better decisions every day, drives greater levels of performance and strongly supports their professional growth and advancement. What is the format and duration of the program? At The Leadership Edge, we use learning and development approaches that have been supported by research to achieve the most successful participant outcomes. We instill increased confidence and competence in the participants and the successful implementation of tools and skills in the workplace. To achieve this, our program format is based on three premises, learning over time, spaced repetition, and accountability. From The Laboratory To Leadership Program: 25th Anniversary Edition, is delivered over four (4) days, with each full day session spaced two (2) weeks apart. This enables participants the opportunity to learn a tremendous amount of content at a pace that is not overwhelming, gives them the opportunity to implement the tools and concepts in the workplace at a reasonable pace, and provides the opportunity for participants to discuss their successes and challenges as they are held accountable in their next session. While this format is our most utilized delivery method, we realize that on occasion, our clients require an alternative delivery format. In these cases we will partner with you to design a delivery approach that supports your needs without sacrificing tremendous results. Although the program is four (4) days, the support of The Leadership Edge and your program facilitator never ends as the result of our free, life-time support. $2,795 per person, for association members*, $3,295 for non-members. This includes a pre-course questionnaire, a multitude of online assessments, customized program materials (binder, instruments, and activities), four (4) full day learning and development sessions, integrated leadership lab notebook to track success and return on investment, one-on-one coaching during the program and lifetime phone and e-mail support. * We partner with life science associations to offer discounted pricing. Our partners include: Biocom, Life Science Washington, CA Life Science Association, Colorado BioScience Association and MassBio. When is payment due? Do you accept credit cards? Payment is to be received prior to the start of the program, upon registration or receipt of the invoice from our office. We accept credit cards through PayPal, however not all corporate credit cards are eligible for this option. Should you like to pay the invoice this way, please let our office know and we will send you a direct link to a PayPal invoice for payment. No PayPal user account is required by the client. Please make your check payable to The Leadership Edge, Inc., or to the association partner if you are registering online for the appropriate location and class on their registration page. Call The Leadership Edge at (858) 454-6540, ext. 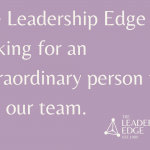 200, or email us at Tiffany@TheLeadershipEdge.com if you have any questions. We understand that sometimes things will occur that might prevent you from attending all of the classes. No problem, we provide several resources to ensure you stay on track. Each participant is paired with a peer coach in the class, to help support each other in your learning. You may call your coach to discuss the content that was covered and gain an understanding of the expectations before attending the next session. The facilitator is also always available to support your continued success in the program and you may attend any future public session through one of our association partners at no cost (if space is available). Is it better to bring our program in-house or have my participants take part in a public class? It depends upon what your goals are. Some of the advantages of attending a public class are that the participants come from a variety of life science companies, are building peer networks outside of your company, gaining new perspectives and ideas external to those shared within your own organization and seeing that your challenges are also common to others. If you have just a few participants, are a small organization, or have a limited learning and development budget, the public programs enable you to enroll individuals as your budget or your work environment allows and insures consistent learning and development opportunities for newly promoted managers as your company grows. In addition, if you are seeking a confidential environment where participants can feel more comfortable in sharing organizational concerns, the public program often times may feel more supportive. In house programs are comprised of only your employees and offer tremendous advantages as well. One of the greatest benefits of an in-house program is that all of the content is customized to reflect the culture, philosophies, systems and goals of your company. In addition, the program provides not only an opportunity to develop as managers, but also supports your employees discussing and working together to resolve issues and pursue opportunities presented to your company. Teamwork and camaraderie are developed as participants engage with managers from their teams and managers/leaders from other teams, departments or functional areas. The composition may be designed by the level in your organization, functional area, or to integrate various levels of leadership depending upon your goals. If I choose an in-house program, how will I structure the classes? Because in-house programs are customized to meet your desired needs, please contact The Leadership Edge to and we will assist you in determining the best composition to achieve your goals. The location for in-house programs are determined by the client. While offsite sessions tend to support greater focus and fewer disruptions, sometimes budget constraints require the program to be held at the client’s site. Programs held through our association partners are typically hosted at their facilities. Do I receive continuing education credit for this program? At this time, The Leadership Edge is looking into approval for continuing education credit for our programs. If this is something you are interested in, please let us know. How many participants will be in a program? The ideal size for a program is 15 to 20 participants. There is no more than one hour per week of independent practice. The program has been designed to assist you in applying the concepts at work as opposed to “homework”. Participants will utilize their Leadership Lab Book throughout the program to set their own goals, layout their commitments between sessions, and track their success. Participants will also interact with their peer coaches and learning pods as needed. How much preparation will there be prior to the program? Approximately 30 minutes. There is a Welcome Email that is sent out two weeks prior to the program with links for pre-work to be completed. This includes a Participant Information Questionnaire, a Myers-Briggs Type Indicator online assessment. These need to be completed prior to the first session. 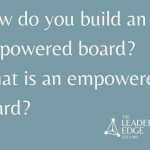 The Leadership Edge uses several tools to measure the effectiveness of the program. Participants set goals for themselves during the second session and share those goals with the return on investment associated, in class. The program learning is then directly tied to the success of these pre-determined goals. Support throughout the program is provided through email reminders, the use of their Leadership Lab Book, peer coaches and their participation in learning pods. In addition, after each session, participants will reflect and report on knowledge gained and implemented. Final course evaluations provide participant feedback on not only the quality of the program facilitation and content, but also on the quantitative and qualitative impact on your organization. How early do I have to register into a public program? Space is limited to twenty (20) participants in our public programs so we suggest no later than fourteen (14) days’ notice prior to the start of the program. Because sessions are filled on a first-come, first-serve basis with many classes being filled several weeks before their starting date, early enrollment is encouraged. However, if you question whether there is enough time or space to register, please call The Leadership Edge for confirmation. We will do our best to accommodate you. For an in-house program, we prefer at least three weeks’ notice to enable us the necessary time to coordinate an excellent program. ARE YOU HOSTING AN IN-HOUSE PROGRAM? U-shaped. If this is not available, please let us know so we can discuss other options. The facilitator will need a table in front of the room for materials. Large enough to accommodate the number of people in a U-shaped environment and large enough to provide enough room to gather into small groups within the room. Ideally they have a place to put their binders, name tent cards and to be able to write comfortably. Refreshments are provided by the host. In a morning session, coffee and juice are recommended. If you would like, bagels and muffins can also be a good “draw” for getting people there on time, but they are not a necessity. Other refreshments like coffee, water and tea are preferred for all session times and throughout the day for full day programs. The Leadership Edge does not provide lunch or meals. Please advise us of lunchtime options for participants; if there is a cafeteria on-site, food options nearby, or kitchen with refrigeration for participants to bring their lunches. Ensure that the room temperature is at a comfortable level that is conducive to learning and can be easily monitored and/or adjusted as needed. Usually 70° to 74° is comfortable. The facilitator will need a contact person at the facility with whom to communicate. We will need their direct dial number and/or cell number for early arrivals, as well as to confirm the receipt of shipping materials prior to the program. If the program is starting before regular business hours, please ensure there is someone to meet the facilitator. The facilitator will arrive about 45 minutes prior to the class. Please coordinate with the facilitator so they may be let in. Please make sure there is ample parking available and that an appropriate guest list is provided so that all participants can be admitted to parking/building. Please locate a facility at least two or three weeks prior to the start of a program so that all participants may be advised. A map and/or directions to the facility should be provided to The Leadership Edge at this time. The facilitator will arrive at your meeting site at least 45 minutes prior to the scheduled start of the program to personally review the physical arrangements and coordinate any final details. NEED AN EXPERIENCED SOUNDING BOARD AND ROADMAP FOR SUCCESS? YOU’RE AT THE RIGHT PLACE.